For twenty minutes, players keep their heads down, hurriedly building, crafting, laying traps. Then the timer reaches zero, giant sand walls fall to reveal opponents, and they fight to the usual conclusive standard (death). That’s The Walls 2, the PvP Survival mod for Minecraft. 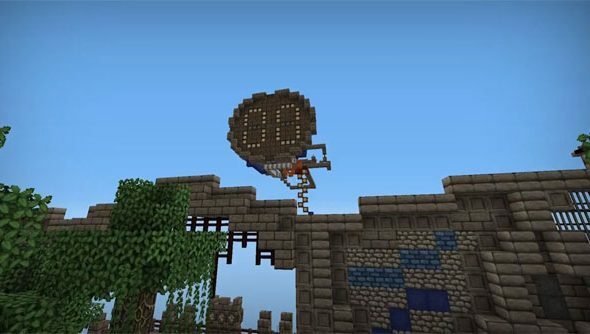 Players can craft armour, build traps, cannons and fortresses, and otherwise work within the usual imaginative limits of Minecraft towards their bloody end goal. This sequel removes diamond from starting zones, instead planting it in the temple at the map’s centre. “Having a middle contested ground forces players to come out of their holes, [and] being offensive is now rewarding,” says creator Hypixel. All of which sounds like a rather wonderful twist on PvP in Minecraft, like a competitive pre-echo of Epic’s Fortnite. Anybody given this a go?